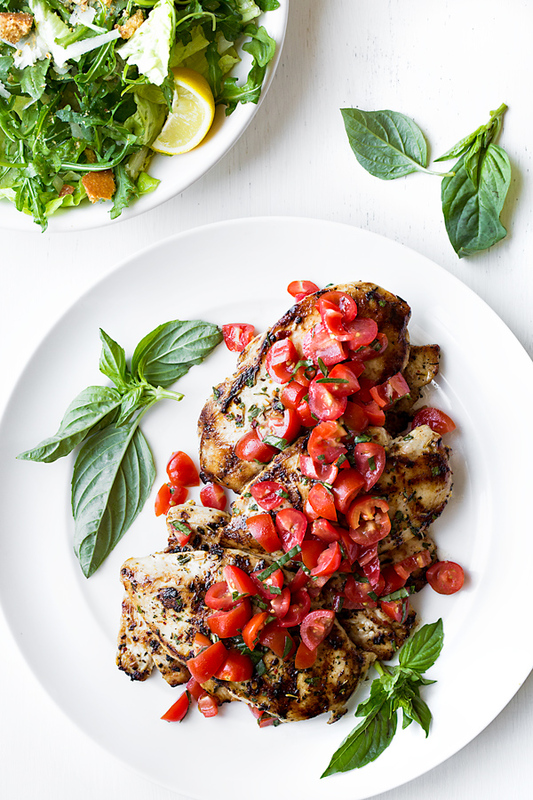 While grilled chicken may not typically be thought of as “gourmet”, this light, fresh and delicious recipe for grilled chicken with tomato-basil salsa may just change your mind! It’s savory and bright, and makes great use of beautiful and flavor-packed seasonal ingredients. 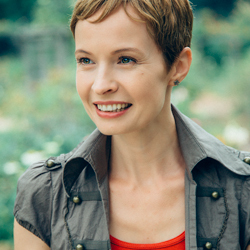 With the return of the sunshine and the warmer weather here in southern California, I find myself thinking about recipes that are lighter, fresher, and healthier options for the season. Chicken always comes to mind as an easy favorite, because it is incredibly convenient and quick to prepare, which makes it all the more desirable. Plus, chicken soaks up tasty flavors like nobody’s business, and goes from plain to gourmet (and a-maz-ing!) in no time flat. Add in a little of this and a little of that—some olive oil, lemon, garlic and herbs—and you’ve got a quick and delicious chicken marinade, with minimal effort. Love that! After just a few minutes soaking up the marinade, it’s ready for the grill, and a finishing touch of something a little fresh, like a juicy and sweet-savory tomato-basil salsa. With only seven ingredients, you’ll almost feel a little guilty about just how easy and how tasty this recipe is… almost. The entire process typically takes me no longer than twenty five to thirty minutes from start to finish, including marination. How to Grill Chicken Breasts, and Make Them Delicious! Grilling chicken breasts is quite fuss-free and simple. 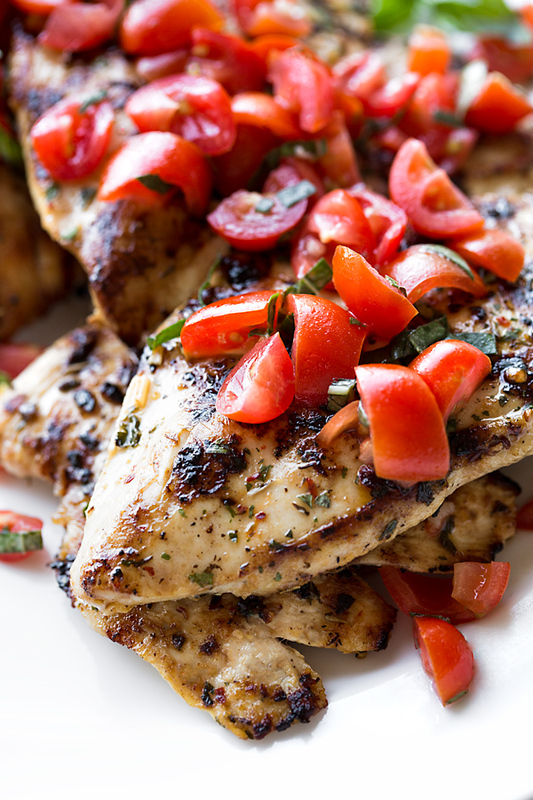 Below are a few of my personal pointers to help you make the best tasting grilled chicken. Always marinate the chicken, first. Even if it is a very basic marinade which uses olive oil, lemon, garlic, salt and pepper, as is the case with this recipe, chicken breasts benefit immensely from even ten minutes in a flavorful marinade. Other ingredients great to use in chicken marinade include spices, herbs, and even a little mustard. Preheat your grill! These days I use my indoor grill pan, but this applies to outdoor grills as well. Placing marinated chicken onto a lukewarm grill is not good eats, and will not only prevent the creation of that flavorful charr (and pretty grill marks), but it will make it more difficult for you to actually turn your chicken over. A hot grill will sear the outside of the chicken quickly, and allow it to release when it’s ready to be turned. Serve with a flavorful topper. As I mentioned above, nothing is tastier than serving a simply marinated and grilled chicken breast with a fresh relish or salsa; but at a minimum, serve it with fresh lemon or herbs for extra flavor and flair. Remember, you can very easily dress up and make more “gourmet” a simple grilled chicken breast with a finishing pop of flavor! Make ahead: Giving the chicken breasts a bit more time in the marinade is always a good thing; so if you can marinate the chicken overnight and grill it off the next day, it’ll be super flavorful. 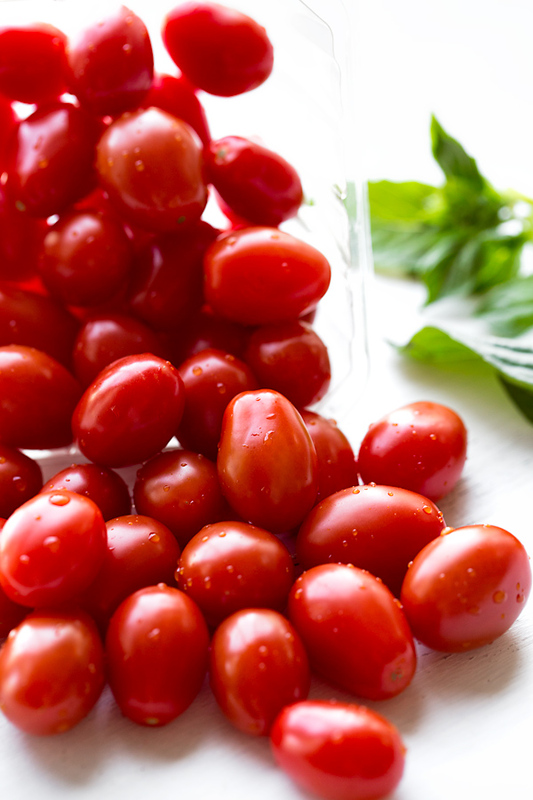 Prepping your tomato-basil salsa: You can dice up your tomatoes for the salsa, but wait until you’re ready to serve before adding in your basil. Basil can lose its color and vibrancy, so julienne it just before adding it to the salsa, when you’re ready to serve the chicken. Alternatives to grilling: If you do not have a grill pan (or outdoor grill), or would simply prefer another method for cooking the chicken, you can simply sear it off in a hot cast iron skillet, or other pan. Get the pan nice and hot, then add the chicken in and sear on both sides for a few minutes, until golden-brown and cooked through. Add leftovers to salad, or make a sandwich: Any leftovers from this delicious recipe are terrific served cold as well—you can slice or dice up the chicken and add it (along with any salsa) to a salad. You can also make a tasty sandwich—a grilled cheese, perhaps? 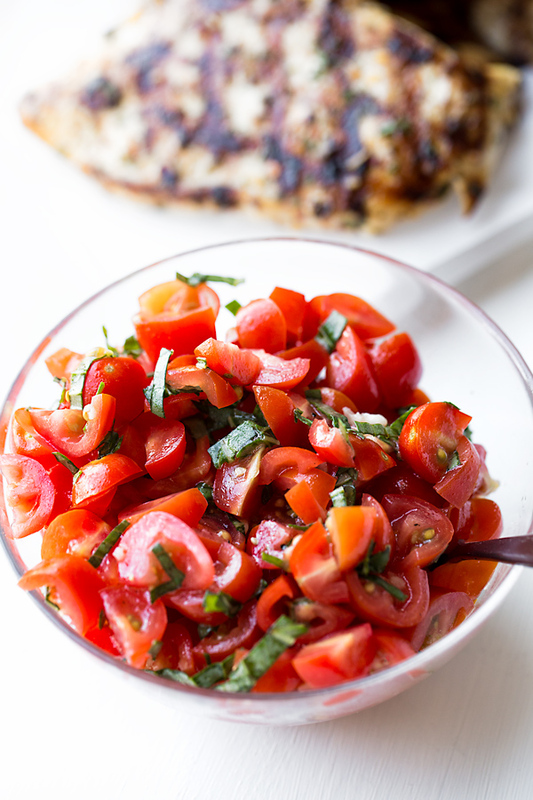 This juicy grilled chicken with tomato-basil salsa is the epitome of “easy gourmet”—it uses only a small handful of flavorful and fresh ingredients, and is on the table in under thirty minutes! –To marinate your chicken, place it into a large bowl, and drizzle over about 2 tablespoons of olive oil, a couple of generous pinches of salt and pepper, the lemon zest and juice, the garlic, and the Italian seasoning, and toss to coat; marinate for 10 minutes (or overnight if prepping ahead.). 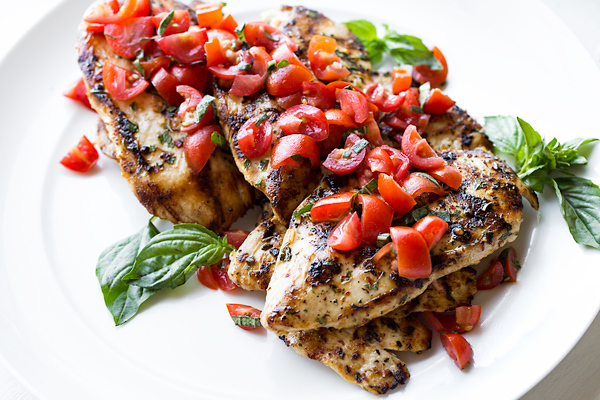 –While the chicken marinates, prepare your tomato-basil salsa by combining the diced tomatoes, the garlic, a couple of pinches of salt and pepper, the lemon zest and lemon juice together, and mix together with a spoon; taste it to see if you need additional salt or pepper; then, when ready to serve with the grilled chicken, add in the julienned (finely sliced) fresh basil leaves, and fold those in. –To grill your chicken, place your grill pan over medium-high heat (or prepare your outdoor grill); once it becomes nice and hot, allow any excess marinade to drip off the chicken, and place the breasts onto the hot grill pan (work in batches, if necessary); allow the chicken to sear on that first side for 5-6 minutes (if you’re looking for that cross-hatch pattern, place the breasts at the 2 o’clock position in the pan, then after a couple of minutes move them to the 10 o’clock position—it creates a criss-cross pattern); then cook on the other side for about 5-6 minutes more, or until the chicken is cooked through. 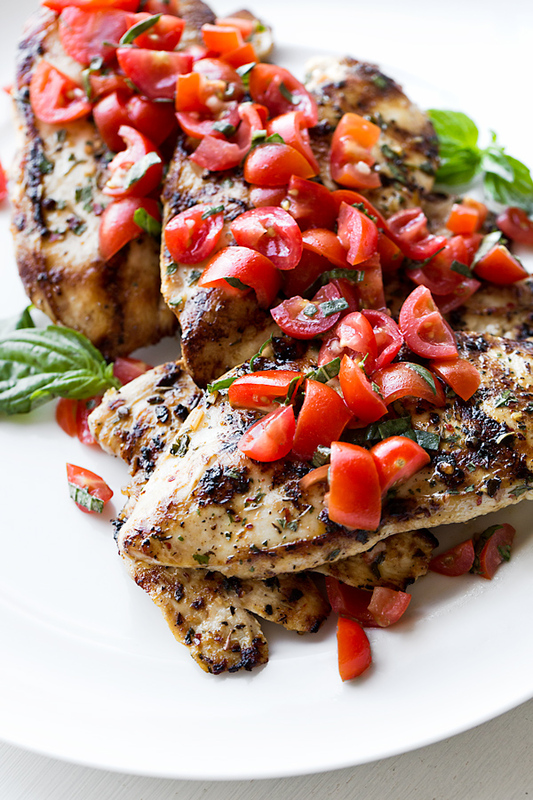 –Place the chicken on a platter, top with the tomato-basil salsa (and extra lemon, if desired), and enjoy! Interested in some more chicken recipes similar to this one? Check out this Southwest Stuffed Chicken Breast, or Provolone, Spinach & Mushroom Chicken Breast! This dish tastes like summer! I served the chicken and tomatoes over some angel hair pasta that I mixed with a little pesto (plus some parmesan on top), along with a baked sweet potato and some steamed sugar snap peas on the side. I loved the simple, refreshing flavors of the lemon, tomatoes, and herbs! Thanks for gracing my kitchen with your creativity and love once again. Hi Melissa, that is so, so sweet of you to say! 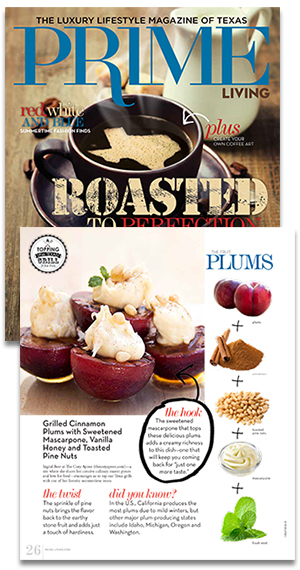 I’m so glad you enjoyed the recipe and made it such an awesome spread! What you served this chicken with sounds perfect, and like a nice, healthy dinner. You’ve made me to happy to know that you’re enjoying our recipes, and I hope you continue to find lots of comfort and nourishment in them. Happy cooking! Labor Day is coming up. Trying to hold onto summer as long as possible! This is perfect. Hey Kristin, that so great!